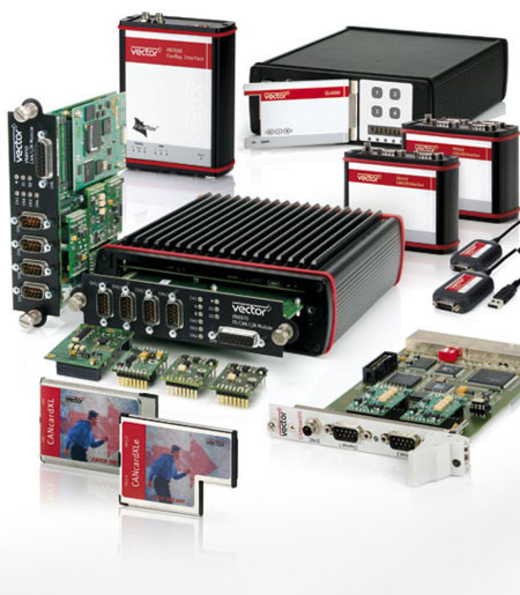 Vector offers interfaces for CAN, LIN, J1708, FlexRay, MOST as well as driver software and programming interfaces for use with Vector software tools and in customer-specific solutions. Especially the VN8900 interface is a high-performance real-time platform when used in combination with the CANoe or CANalyzer tool. Its many use cases range from MiniHIL applications to system simulations with Simulink, rest-of-bus simulations as well as gateway implementations and test runs. Choose from a steadily growing number of Vector bus transceivers known as CAN-/LIN/J1708cabs, CAN-/LIN/J1708/FRpiggies and the TWINcabs. Operation of channels can be done in combination of the available transceivers.